There is so much more of our world to discover than what we see on land. The surface of our planet is predominately covered by oceans, 70 per cent of it in fact, and we have explored just five per cent of it. We have all been astounded by Blue Planet II on the BBC, so why don’t you consider getting in on the act? Whether you are exploring the Indian coastline, or want to try something new on your holiday to Vietnam, there are countless diving opportunities across Asia. While we can’t all descend into the deep in a submersible, we can explore the reefs and shallows thanks to scuba diving. Coming face-to-face with mesmerising marine life in their natural habitat in some of the world’s most beautiful locations, both above and below the water, is an unforgettable experience. 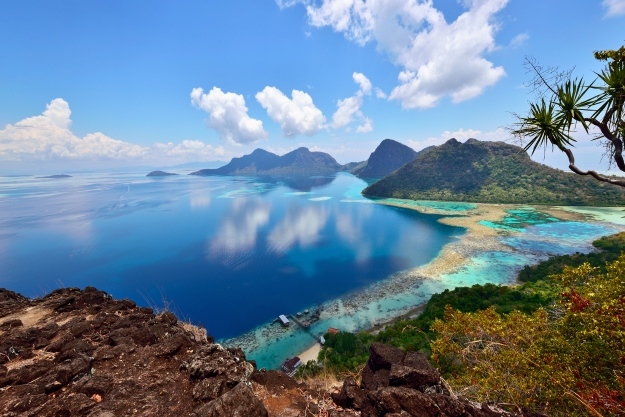 From the Indian Ocean to the Pacific, in this article we will highlight some of the best diving destinations in Asia, where your options are vast and equally stunning. Not exclusive to gap-year students, Thailand is one of the world’s finest scuba-diving locations. 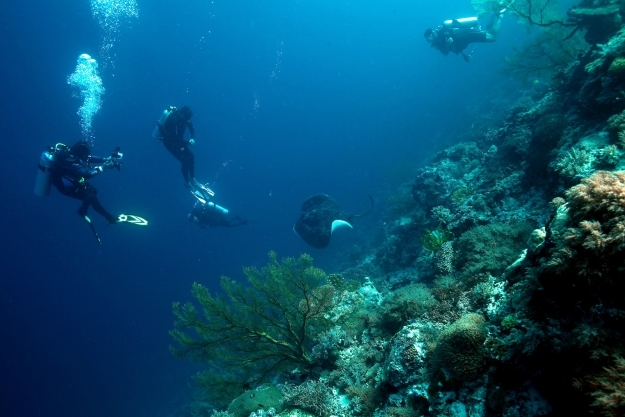 Its developed tourism industry has helped develop a thriving diving scene, helped to no end by the natural beauty of the area. Warm, clear waters are alive with a diverse selection of marine life. Everything from elegant manta rays to colourful reefs inhabit the shores, particularly off the many islands. Beginners can find a huge choice of calm, shallow bays while more advanced divers can head out to the deep ocean and even explore shipwrecks. In the Andaman Sea, Phuket is home to two of the country’s best diving sites. The area is one of the most developed, in terms of tourism, thanks to the white beaches and bustling towns. But beneath the waves you forget about the other holidaymakers. Spots like Richelieu Rock, a horseshoe pinnacle made up of soft corals, and Shark Point, a more extreme experience which also has reefs but a great abundance of tropical fish and of course, sharks make this one of the best diving destinations in Asia. 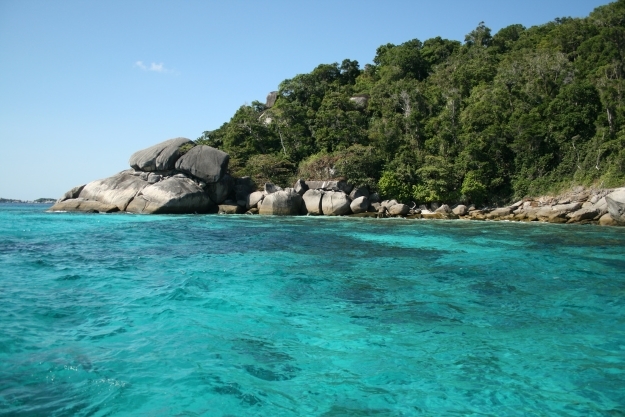 A Thailand National Park since 1982, the Similan Islands and all of its inhabitants are protected by law. These restrictions have allowed life to flourish, with this being a popular spot to witness some of the most popular tropical fish in the water. The 11 islands are closed through May to October due to the monsoons, but that doesn’t stop this being a world-class diving destination. Just a short ferry ride from Phuket are the Phi Phi Islands, a picture-perfect location with scenery and a landscape to cause a serious case of wanderlust. The waters off these islands are full of great diving opportunities, but Koh Bida Nok and Koh Bide Nai are the most colourful and lively. Scuba diving doesn’t always spring to mind when you think of India. As vivid as the country is on land, its underwater world is no less stunning. Here you will find some of the most spectacular formations, in particular Dixon’s Pinnacles, as well as an abundance of life. But this really shouldn’t be much of a surprise given that you have 5,000 miles of coastline along India to dive from. In the Bay of Bengal lies the coastal city of Pondicherry. Known as Puducherry locally, it is extremely popular amongst domestic tourists, with there being almost ten times as many visiting in 2015 than those coming from oversees. Indian waters are blessed with some of the sea’s most interesting marine life and Pondicherry is no different. 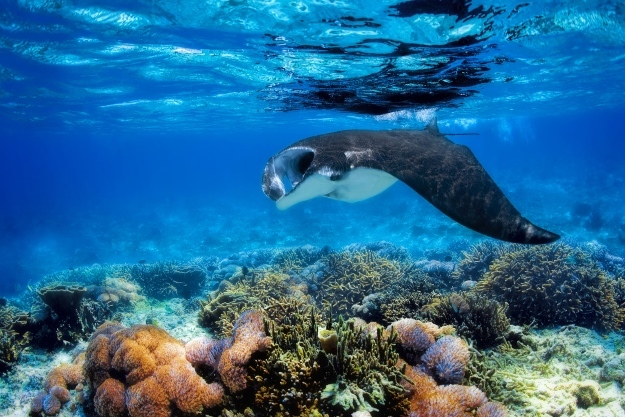 Whale sharks, manta rays, turtles, dolphins and even sharks frequent these waters and any underwater encounter will certainly make your holiday that bit more memorable. Due to global warming, many natural reefs are experiencing bleaching, where they die and turn white. As such, more and more artificial reefs are being created to help attract wildlife and ultimate, give those species a home. Temple Reef is one such example, made from fully recycled materials including concrete blocks, palm leaves, iron bars and more. Completed in October 2013, it is now the home to a very diverse neighbourhood of moray eels, sea snakes, parrot fish, butterflyfish, triggerfish and so much more. All 572 islands that make up the Andamans are protected from commercial fishing by the Indian government, meaning the likes of black marlin, sailfish as well as small and bright reef inhabitants can flourish. 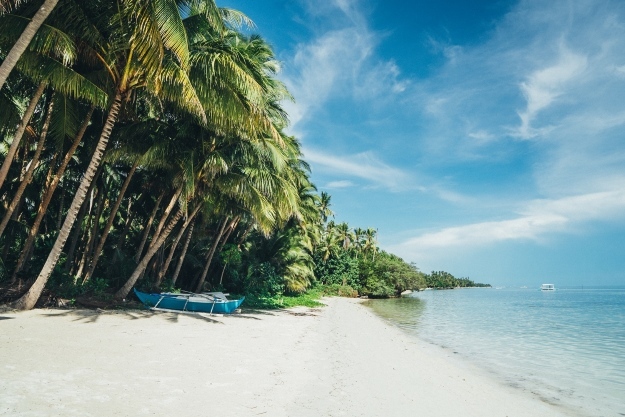 Many of the best diving spots here are to the south of Havelock Island and Neil Island, where you can dive into the toasty tropical waters which can reach 29˚C. Another hotspot for young travellers hoping to enrich their lives is Cambodia, another one of the best diving destinations in Asia. Small islets and islands scatter its coastline, which, while not as large as others on the continent, still offers very exciting opportunities. Koh Tang is a particularly popular location amongst those in the know. Set in the Gulf of Thailand it has a number of sites to choose from, like Three Bears and the ominously named Explosion Reef and Sting Ray Alley. As you could expect, the latter is the known for frequenting stingrays, while Three bears is a stunning formation of caves and vivid corals. Visibility in Koh Tang is second to none, which, as any experienced diver will tell you, is vital. Borneo’s rich ecosystem is well documented. The world’s third largest island is famous for its orangutans, while elsewhere on land there are more than 15,000 different plant species and 222 mammals, 44 are indigenous to the island. In the waters you can swim with the 394 different kinds of fish, ranging in brilliant colours and sizes. It is an ever popular luxury holiday destination, but many limit themselves to the onshore activities. Beneath the waves the beauty of the marine life coupled with a dynamic seascape will astound divers of any experience. Sipadan Island is an unspoilt, mostly undisturbed piece of nature where the wild has been allowed to flourish. Don your suit and marvel at more than 3,000 species of fish and 100 types of coral. The area itself has more than 100 dive sites including 12 which are regarded internationally as some of the finest on Earth, including Barracuda Point. 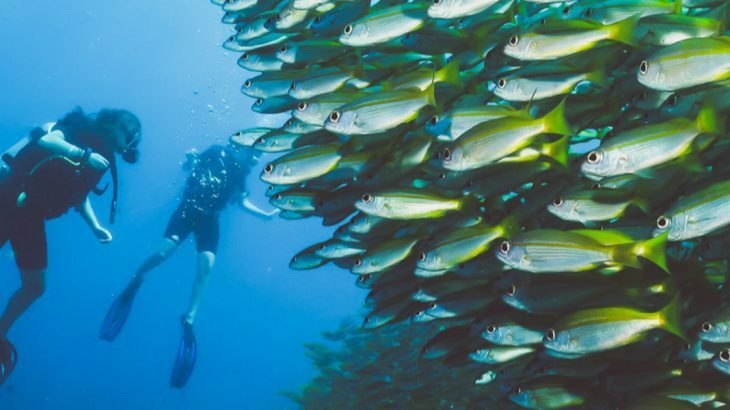 Named one of the Top 10 Dives by Scuba Travel and featuring in the Top 50 Best Dive Sites in the World by Sport Diver, Sipadan is certainly one of Asia’s best diving destinations. For many years, Vietnam has been one of the most popular travel destinations in Asia. Its pristine beaches, idyllic coves and tiny islands form an area of staggering natural beauty, both on land and at sea. New divers keen to learn during their travels and those who are more experienced are gradually choosing Vietnam over its neighbours. The country is still a few years behind the likes of Thailand in diving heritage, but what it lacks in history it makes up for with its dynamic dive sites. A coastal city in Vietnam, Nha Trang is best known for its beaches and the quality of scuba diving available. Postcard perfect beaches line its shores, while many consider the bay here to be the world’s most beautiful. Modonna Rocks, offering swim-through caverns take you up close and personal with moray eels, octopus and even lionfish that patrol the clear waters. Elsewhere, Moray Beach is another of Nha Trang’s best dive sites. Perfectly suited to beginners, this area perhaps offers a better supply of marine life, ranging from the ever popular clownfish to razor fish. “I visited the Philippines as part of a year-long trip through Southeast Asia in 2015-16. Although I’ve been a scuba diver for 17 years, no country has captured my interest in the same way. There’s an incredible amount of diversity and each experience is unique. Some of the best dive sites in the Philippines include the fascinating wrecks of Coron and the thresher sharks of Malapascua. I swam among a giant shoal of sardines in Moalboal and saw intensely coloured, gigantic corals in the waters of Apo Island near Dumaguete. Reachable only by liveaboard boat, Tubbataha Reef is frequently cited as one of the best dive sites in the world. 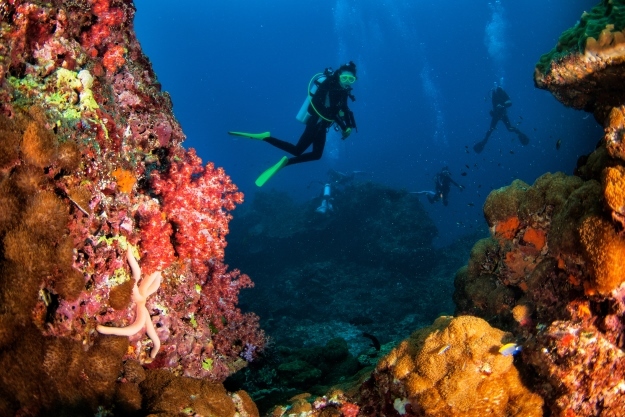 Diving in the Philippines comes with the added bonus of being affordable and easily accessible. “My favourite place to dive in Asia is the Philippines. I love not only the variety of the sites and undersea life, but also the quality, the price, and the fact that you can find incredible dive sites all over the country! I’ve also done some incredible diving in Indonesia and Thailand, so it’s a tough choice for me, but the Philippines has completely blown me away! 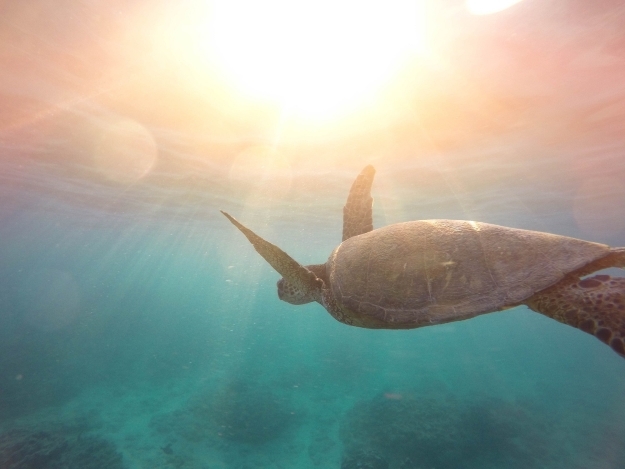 Beneath the waves, more than 1,200 marine species reside. The waters here are truly alive, and each dive spot unearths new and exciting discoveries. 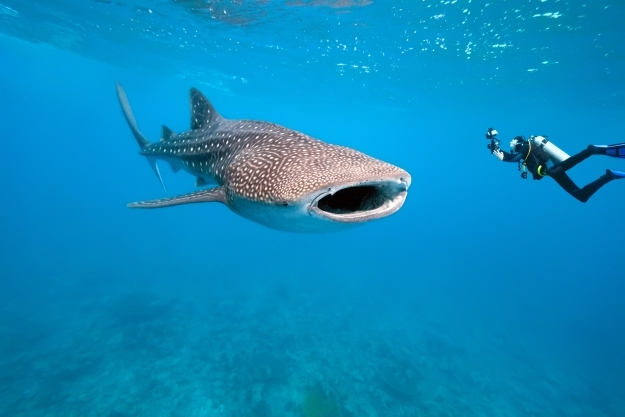 If you are diving to see a broad range of different animals then Monad Shoal may well be the diving location for you. Close to Malapascua Island, there are very few places on Earth where you can see the thresher shark, but this is one. Between 16-32 metres below the surface, Monad is an entirely submerged island, with daunting 200 metre drops at either side. Stick to the shallows for the colourful reef-life, or venture into the deep for a glimpse of giant manta rays, sharks, eagle rays and even tuna. A designated National Park, Tubbataha Reef sits in the middle of the Sulu Sea. Roughly 374 coral species, 600 fish species, 11 shark species and 13 dolphin and whale species call this place their home. It is widely considered to be one of Asia’s best diving locations and after being classed a UNESCO World Heritage Site in 1993, it was nominated as one of the New 7 Wonders of Nature in 2008. To get a real feeling of diving in Sri Lanka, we wanted to speak to one of the experts. Dharshana Jayawardena from Dive Sri Lanka knows more about this area than most: “When it comes to best kept secrets, SCUBA diving in Sri Lanka is right up there. Few people are aware of the variety of diving sites all around Sri Lanka consisting of shipwrecks and coral reefs. Florine is a travel writer, photographer and videographer at World Adventure Divers. With three and half years of scuba diving experience under her belt Florine has amassed more than 400 dives and knows a thing or two about a good diving location. We therefore asked her why Asia is so special: “Asian countries have the best combination of adventure, delicious food and diving in incredibly preserved sites such as Tubbataha Reefs in the Philippines or the Similan Islands in Thailand while being extremely affordable. Instead of sitting on a beach or exploring the town on your holiday to Vietnam, or anywhere in Asia, why not step into the water. Jump out of your comfort zone and into the largely undiscovered underwater world. General adventure, nature, ocean, scuba diving. permalink.